In my last post we began to explore the idea of living strategically. After Jesus rose from the dead and as He was ready to ascend back to heaven He outlined for His followers the strategy in which He would lead us for the rest of time. Jesus laid out for them and us the strategy that would usher Him back to earth in His Second Coming. This was not something just for the first century, but for all the centuries to come. This was not something just for super-Christians, but for all us ordinary Christ-followers in all ages and in all places. If we are Christ’s, we’re all on one mission—God’s. What does it mean to live strategically? Honestly, when I saw the second part of the definition, I was surprised. That’s not what came to mind when I thought of “strategic.” But then life is often a battle, isn’t it? What do you need in this arena of battle/life which you may not possess in sufficient measure? Several things, including: purpose, vision, power, and intentionality. The unfolding of the rest of history is laid out in this simple sentence. This is the God-designed, divinely-ordained strategy for all the rest of time—for His entire Church, for each church, and for every Christian. Let’s consider just the first prong of this four-fold strategy—reaching our Jerusalem. Each prong operates on two axes: geographical and cultural. To identify and deploy strategically into your “Jerusalem” think in terms of those “geographically near” and “culturally like” you. I’m talking about people close at your hand and “like” you in things like income, neighborhoods, tastes, schools, work, ethnicity, language, etc. Jesus is calling each of us to live strategically (with purpose, vision, power and intentionality) in relationship to the people He has put near to us both geographically and culturally. How are we to do that? When you’ve completed that step, slip the paper into your Bible so you see it each day as you read God’s Word and pray. Include these people specifically in your praying. In addition to praying, watch for opportunities to step intentionally more deeply into relationship with those you’ve identified. It may come through an opportunity for conversation. It might be through the possibility of assisting them with something. Maybe the Lord will open a chance to spend some time with them. Be encouraged! You are beginning to move with God in your immediate corner of the world! Once you’re past trying to get God to bless your personal mission and realize the Christian life is about abandoning your long-loved private mission and surrendering the rest of your life to God’s mission (the Bible calls this repentance; it is the beginning point of one’s journey as a disciple of Jesus Christ), then you are ready to consider living life strategically. After Jesus rose from the dead and as He was ready to ascend back to heaven He outlined for His followers the strategy in which He would lead them (and us!) for the rest of time. He laid out for them (and us!) the very strategy that would usher Him back to earth in His Second Coming. This was not something just for the first century, but for all the centuries to come. This was not something just for super-Christians, but for all us ordinary Christ-followers in all ages and in all places. If we are Christ’s, we’re all on one mission—God’s. 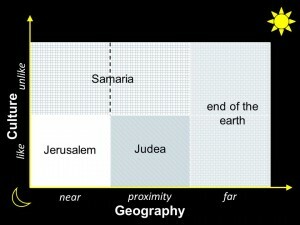 to the ends of the earth (Acts 13:1-28:31). God gave us the Book of Acts to show us something of how the strategy was to be employed and the power and blessing we can expect when we surrender ourselves to God and work His strategy. But I invite you to look at Acts 1:8 again, not just as an outline of Acts and the church’s activity in the first century, but as a strategic call to live your life on mission with God. Read Acts 1:8 again, this time as the plan for every century and all the followers of Christ, including you and me. This is to be a collective mission (the Church), a corporate mission (each church), and a personal (each Christian) mission. within our generation anywhere on the earth. You will notice that living strategically in line with God’s mission involves living along two axes (that is the plural for axis, not a reference to two or more long-handled hatchets!). One axis is geographical. The other is cultural. Axis #1: Geographically near to me (think “where I live”). In additional posts I want to unpack what living strategically with Jesus means for each of us where we live. Until then, can you begin to identify people/groups/areas/towns/etc. in your life that fit each of these strategic target groups? For two decades Tim Keesee has traveled the planet, engaging the frontline forces of the King as they advance the Kingdom of light and push back the boundaries of the kingdom of darkness. Written in travelogue form, Dispatches From the Front provides windows that allow us glimpses into the hard facts and spiritual realities at play in the combustible confrontation of light and darkness. Keesee not only tells the stories well, he tells them artfully, and with spiritual grace and sensitivity. He weaves elements of church history, personal worship and Biblical insight into his factual reporting. While he does not whitewash the hardships—and the realities can be grim—the spiritual impact of reading Keesee’s reports and reflections is one of uplift of the soul, confidence in the gospel, and joy over the faithfulness of our brother’s and sister’s in Christ. Dispatches From the Front made me want to live more courageously, to move in faith, to risk, to live well for the glory of Christ. I highly recommend this refreshing, faith-stimulating, joy-inducing book.